Maybe it was the lisp. Maybe it was the darkness behind almost every gag. Maybe it was Matthew bleedin’ Broderick. Whatever it was that turned you off The Cable Guy, it’s time to switch yourself back on to it. This is a comedy that is already ageing magnificently, simply because there was nothing quite like it at the time. Ben Stiller’s film was panned by critics and audiences alike on its release in 1996. Those hoping to see a simple buddy comedy were thrown by its innate creepiness. Jim Carrey fans expecting 90 minutes of mere gurning were put off by, uh, the innate creepiness. There is something about The Cable Guy that just crawls right under your skin. If the Farrelly brothers ever remake Single White Female it could end up looking something like this. Matthew Broderick is Steven, an ordinary guy who comes across Chip Douglas/Ricky Ricardo/Larry Tate (Carrey) when the latter installs his cable. From there it’s a stalkomedy of the highest order, as uncomfortable as watching your uncle dance at a wedding yet just as hilarious. The performances are all spot on. People talk a lot about the gap between Carrey’s so-called ‘funny’ roles and his ‘serious’ roles, but what you forget is how superb an actor he is when doing the very difficult job of comedy. Is his best performance to date really The Truman Show or Eternal Sunshine Of The Spotless Mind? Not if you’ve had the fortune to sit through Me, Myself & Irene or Lemony Snicket’s A Series Of Unfortunate Events. While he may not reach the heights of those last two movies in The Cable Guy, it’s still one of his greatest displays. Pitiful and frightening at the same time, Chip/Ricky could walk into any stalker thriller with ease. Not only does The Cable Guy deserve a reprieve, it deserves to be held up as one of the most original comedies of the 90s. WHAT DO YOU THINK? DOES THE CABLE GUY DESERVE A REPRIEVE? This entry was posted on May 27, 2010 at 9:49 am and is filed under REPRIEVES with tags Ben Stiller, Jim Carrey, Matthew Broderick, Movies, The Cable Guy. You can follow any responses to this entry through the RSS 2.0 feed. You can leave a response, or trackback from your own site. The Cable Guy is a stone cold classic and by far the best thing Stiller, Carey, Apatow, Black etc have ever been involved with. Great stuff that gets better with age. 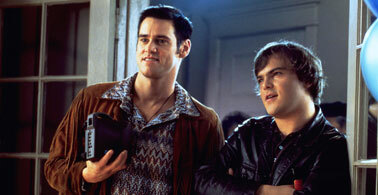 Loved The Cable Guy too, have seen it a couple of times and you’re right it definitely stands the test of time. Carrey really pulls off the whole stalker thing, it’s so creepy. What? You mean there are people who don’t like “The Cable Guy”? I wouldn’t know — I try not to associate with such unsavory types. This is a great, very dark and misunderstood comedy, and maybe my favorite Ben Stiller outing. Jim Carrey will haunt your dreams. At first I thought the above image was the real life Ross and Ross sat at a dinner table watching something that made one confused while the other was sent into the giddy raptures of a three year old kid who’s just learnt to fart with his armpit. The Cable Guy was a film that I didn’t like on first viewing and it has grown on me. I think the problem I had with it at first was it didn’t fit with the humour or characters that Carrey was known for at that time. It’s dark, he’s the bad guy and he’s quite unlikable. But, on subsequent viewing that dark, oddball humour is what makes it watchable. I liked it more than I should have as a child, I think that bothered my parents. it KILLS me to say this, but on a recent rewatching, this wasn’t as offensive as I remembered. My hate for Broderick obviously overwhelmed my love for Carrey first time round. I theorize that my love for Carrey has since grown even stronger, while my hate for Broderick had no room to grow anyway.